What to do with farm fresh eggs? Something that showcases egg, obviously. I decide on a really good, basic egg salad. I turned to a few of my favorite sources: How to Cook Everything, the New York Times, the Food Network and the Joy of Cooking. And get this: None of them gave me an easy-to-find, basic recipe. I don’t want asparagus-and-egg salad or egg salad with caviar. Seriously, do people just keep caviar around in their kitchens? Sigh. I have no choice but to interpret my search results as, “If you can’t figure out how to make egg salad, we’re not going to help you. STUPID.” Don’t call me stupid, cookbooks/Internet! I just wanted some help on the proportion of egg-mayo-mustard-herbs-spices! Anyway, I was left to fend for myself. You know what that got me? A pretty good egg salad sandwich. With farm-fresh eggs! Fresh chives! Stone-ground mustard! 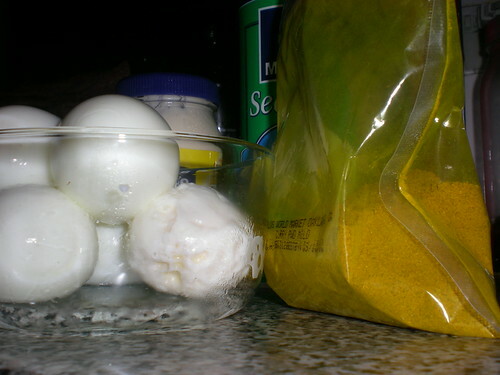 (And of course, mayo, salt and pepper.) You want a recipe? 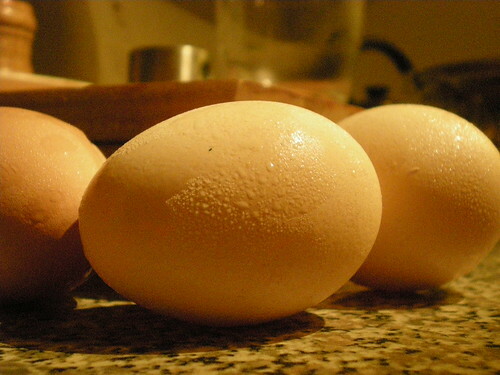 Directions: Hard boil your eggs (12-14 minutes), then cool under running water. Peel them. Smash (with fork) in a bowl. Add mayo, mustard, spices (as you like) and chives (or other herbs, as you see fit). Feeling fancy? Add chopped onion. Cooked potatoes. Celery. I even saw recipes with raisins and apples, but I wasn’t interested in that (see above). (People: Is it so wrong to want plain, simple egg salad? In which the egg shines through?) ALSO: Be careful not to add too much salt (I speak from experience — though the farmers market oat bread balanced it out nicely.) Pile on good bread, with lettuce and tomato. For sandwiches, makes roughly 3-4 servings.